The battery on your Windows 10 laptop or tablet is one of its most critical pieces of hardware. Over time, a battery's life span shortens, and its ability to hold a charge decreases. It's inevitable, gradual, and to be expected when using mobile devices. However, if you suspect your battery's performance is fading a little too quickly, you can perform a battery diagnostic with a simple command. Windows 10 has a built-in feature that allows you to create a battery report with a simple cmdlet (command-let) via PowerShell. Each report gets saved as an HTML file that you view in a web browser and includes data on your system, all installed batteries, usage, capacity history, and battery life estimates. 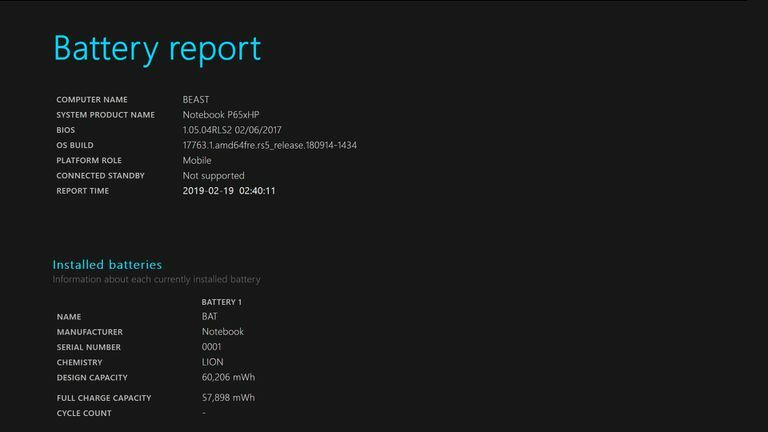 To create a detailed battery report on your Windows 10 laptop or tablet, you'll have to launch PowerShell in admin mode, then run the powercfg /batteryreport command-let. Press Windows key+X, then select Windows PowerShell (Admin). Select Yes when the User Account Control box appears. Enter powercfg /batteryreport /output "C:\battery-report.html" into PowerShell, then press Enter. To avoid mistakes, copy the above command, then right-click the cursor in PowerShell to paste it. Once you run the battery report command, you'll see a message in PowerShell with the location it was saved to. Open Windows File Explorer, navigate to This PC > Windows (C:), then right-click battery-report.html and select Open. Your battery report will open in your default web browser. With your battery report generated and open, it's time to go through each section to gain a clearer picture of your battery's performance, and estimated life expectancy. The first section, directly under Battery Report, lists some primary system information such as your computer's name, BIOS version, OS build, and the date the report was created. The second section, below Installed batteries, lists key information about your laptop or tablet batteries, such as name, manufacturer, serial number, chemistry, and design capacity. This section gives you a detailed overview of when your device was either running on battery or connected to AC power. Recent usage covers your device's power states for three days and includes start time, state (active/suspended), source (battery/ac), and capacity remaining. This area lists any battery drains over the last three days before generating the report. If your system ran for extended periods on battery alone, this section would break it down by start time or duration, as well as by energy drained. Under this section, you'll see a complete history (including duration) of each time your device was running on either battery or AC power. Reviewing your usage history is a great way to see how often and for how long you run your device on battery power. In this section of the report, you see full charge capacity compared to your battery's design capacity for each period. Watching your full charge capacity is another helpful way to monitor the overall health and performance of your battery over time. The final section of the report displays battery life estimates at full charge, compared to the designed capacity. This area gives you a clear outlook of how well your battery's life is holding up over time. At the very bottom of the report, there is an estimated battery lifetime value, based on observed drains since the last OS installation.